Effectively managing an Emergency Department (ED), especially in this time of tremendous service pressure and rapid change, is one of the most challenging jobs in health care today. ED managers across the country tend to share similar problems and interests, and in essence speak a common language which is not understood well by those outside the specialty. One of the best parts of EDBA membership is being connected to others within this world, and being connected with new skill sets and concepts which can help address these specific issues. There could not be a better time to focus energy on the Emergency Department, at a time when so many citizens are relying on a site of excellent unscheduled health care. 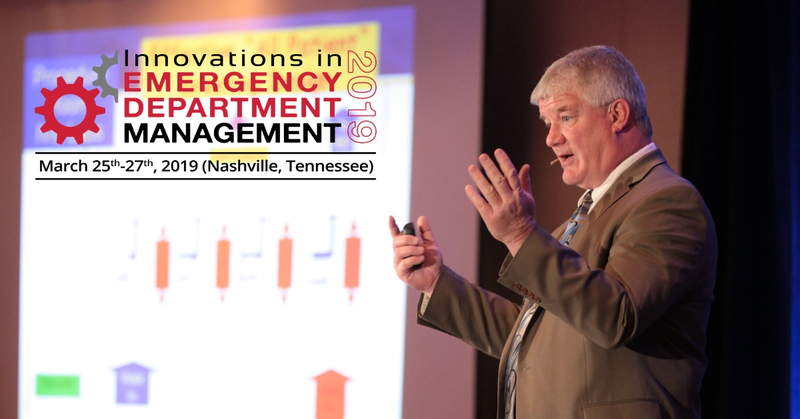 EDBA has just finished their 2019 Innovations in Emergency Medicine meeting in Nashville, TN. There were 17 posters submitted for the poster session and while they were all great, there was a winner and a runner up. 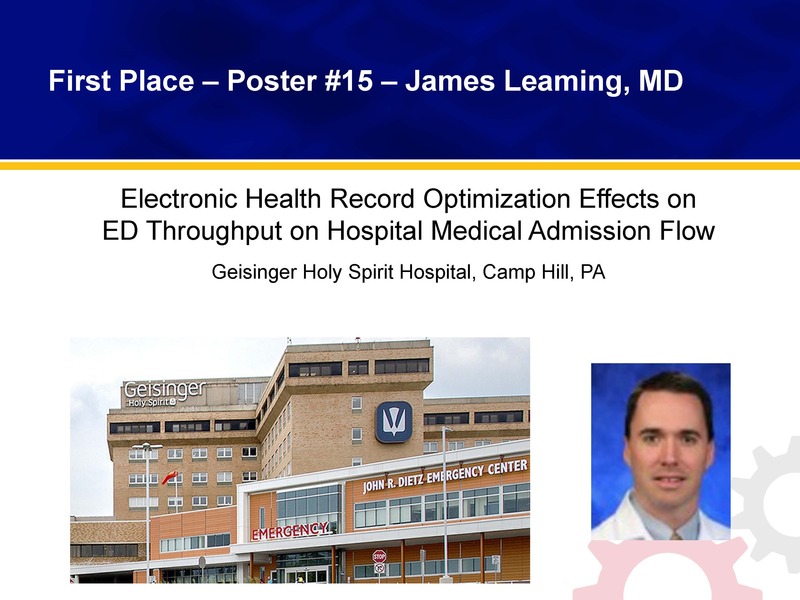 EDBA would like to Congratulate our winner, Dr. James Learning, Geisinger Holy Spirit Hospital. 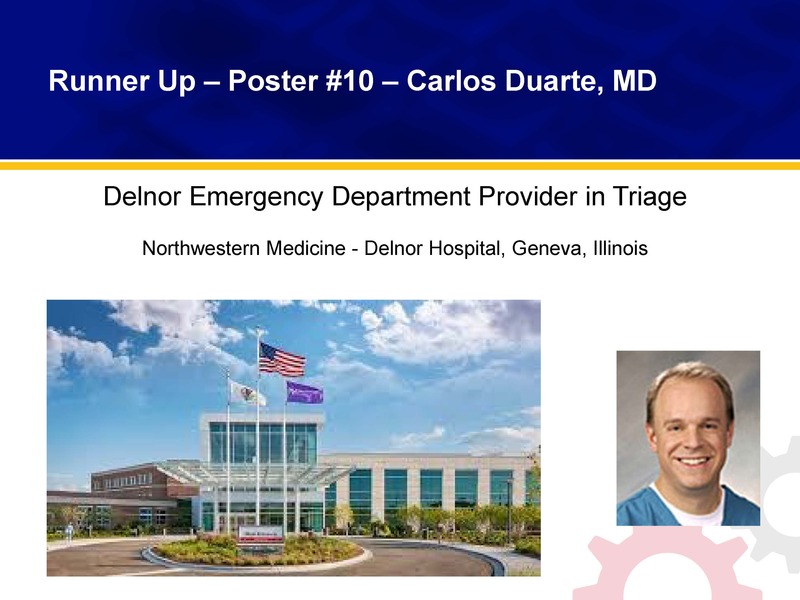 Dr. Carlos Duarte, Northwestern Medicine Delnor Hospital was our runner up. Click below to view abstracts from the 2019 Innovations in ED Management Poster Session. After reading through the EDBA ED Operations Definitions, please use the link below to make comments. The Emergency Department Benchmarking Alliance (EDBA) provides its members with an independent, unbiased database of demographic and performance metrics. This database contains some of the cleanest information in the business. One of the best parts of EDBA membership is being connected to others within this world, and being connected with new skill sets and concepts which can help address these specific issues. Each year, EDBA produces an unparalleled report and hosts a webinar to highlight Emergency Department Performance Measures. The webinar presents the findings from the operating statistics for over 1,100 Emergency Departments and 40 million patient visits. The information presented assists our members in assessing their Emergency Department operations, which leads to improved quality medical care and patient satisfaction.